In November 2008, four tiny babies were born out in a Masaai village, far away from medical help. Amazingly, this morning gave birth to all four infants normally, and they all survived. Sadly, the mother began to bleed profusely after giving birth, and died. The family took the three girls and one boy to Mt. Meru Hospital in Arusha, as they were premature. An older sister stayed at the hospital to help care for the babies, who over a months time, gained enough weight to be discharged. The father came to Cradle of Love to ask us if we could help him with the children. We were ecstatic to get them. For some reason, the social welfare officer advised the father NOT to allow them to come to us, but that he should take them home! The director of Cradle had a special unit built that fit onto a changing table. 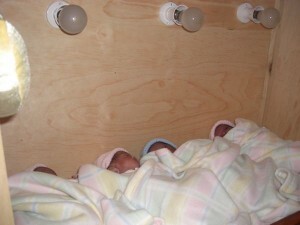 There were lights within to help keep the babies warm and the open front, had protective mosquito netting. All four babies slept side by side in their “cubby”. 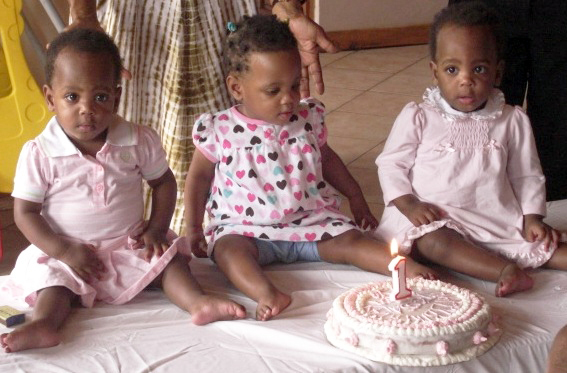 As the babies were so tiny, the director kept them at her house for specialized care. About a month later, the babies were moved to Cradle. One day the little boy, Quin, began having trouble breathing, a sure sign of pneumonia. He was taken to the hospital and put on oxygen, but his small lungs just could not manage and he died. It was devastating. The director returned the three girls to her home until they got a bit bigger. Anya, Nina and Tessa have thrived. Anya and Nina are identical and even the staff have taken to calling them together (Anya-Nina!) as they can’t tell them apart. Tessa looks very different from her sisters and is a much quieter personality. Their doting father comes to visit them every month, as well as some older siblings. I have never met an African man who is so demonstrative and appreciative! Especially as Masaai men are usually rather stoic. He hugs the director and gives a huge smile, every time that he visits. The family plans to take them home at the beginning of 2011.